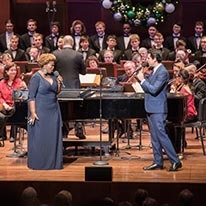 Seattle, WA – The Seattle Symphony celebrates tenth annual Celebrate Asia concert on February 11, 2018 at Benaroya Hall. Celebrate Asia honors Seattle’s Asian American community through a concert that explores the rich musical traditions of Asian countries. This annual celebration is presented with a myriad of pre- and post-concert performances that reflect various Asian cultures. Now in its tenth year, Celebrate Asia has become an annual tradition where people and families of all ethnicities come to immerse themselves in an afternoon of cultural exchange and vibrant celebration.